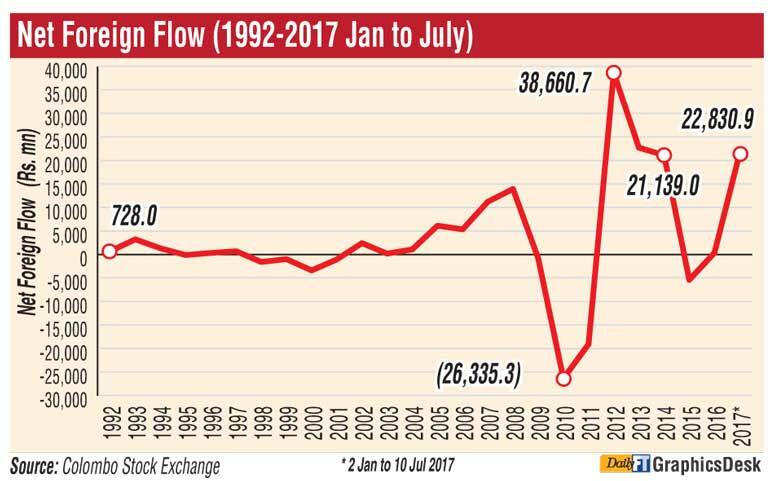 The year to date net foreign inflows to the Colombo stock market for 2017 yesterday reached the second all-time high, a development which Daily FT on 12 June predicted was likely. Yesterday foreign investors bought Rs. 101.1 million net worth of shares, pushing the year to date figure to Rs. 22.8 billion, thereby overtaking the previous second best full-year net inflow of Rs. 22.7 billion achieved in 2013. A few weeks ago, the Colombo Bourse surpassed the third highest ever full-year net inflow figure of Rs. 21.4 billion recorded in 2014. Daily FT in its 12 June article hinted at the stock market moving towards a three-year high after the year to date figure crossed the Rs. 20 billion mark on 9 June. The CSE’s highest ever net foreign inflow of Rs. 38.6 billion was recorded in 2012. With over five more months for the year’s end, analysts are debating whether the all-time record figure could be surpassed. “What is required is a further Rs. 16 billion, which is challenging but not impossible if the country further improves its attractiveness for listed equities among foreigners,” an analyst told the Daily FT. The current attractiveness of the Colombo Bourse in terms of the Price Earnings Ratio is around 11.57 times with PER of several good stocks more favourable. In 2016 the PER was 12.37 times and in the preceding two years it was 17.98 times and 19.66 times. “This shows Colombo remains attractive, signaling there is further upside for discerning investors. Foreigners have been the first to recognise and act whilst the locals continue to debate over prospects losing opportunity,” another analyst opined. “It is disappointing locals continue to maintain a ‘wait and see’ attitude,” he added. The year to date performance of 2017 is impressive considering the fact that last year net foreign inflow in the secondary market was only Rs. 383.5 million whilst in 2015 the market suffered a net outflow of Rs. 5.37 billion. Total net foreign inflow for both the primary and secondary market as of yesterday was Rs. 32.38 billion, much higher than the Rs. 2.28 billion achieved in 2016. Year to date the Colombo stock market is up by 8.5% in terms of the All Share Price Index and 11.67% in terms of the S&P SL 20 Index. At present the market is at an 18-month high. The gains are impressive given the fact that the ASI had declined by 9.7% and 5.5% respectively in 2016 and 2015 whilst the S&P SL was down 3.6% and 11.3%.